Varroa mites are annoying little creatures that every beekeeper loves to eliminate. These mites can ruin the entire bee colony if left untreated that’s why there is an array of methods that can be done to control and even completely remove these unwanted arachnids. Physical, behavioral, and mechanical methods can control varroa mite population while chemical measures can eradicate them completely. Of all the methods, the chemical approach is the most common practice to treat varroa mites. Chemical measures come in two forms: synthetic and naturally occurring chemicals. Synthetic chemicals include pyrethroid insecticide as strips, organophosphate insecticide also as strips, and Manley’s Thymol Crystal as food. On the other hand, naturally occurring chemicals include formic acid as pads or vapor, powdered sugar to be sprinkled on bees, essential oils like mint, lemon, and thyme, sugar esters, oxalic acid as vapor, mineral oil also as vapor or direct application, and natural hops in strip applications. These chemicals are proven varroa mite treatments, however, proper application is required to avoid the development of mite resistance. Indeed, there are plenty of chemicals that can be used to remove varroa mites. It is easy to go online and simply search for an effective treatment. The problem is finding out which one works the best. To narrow down your options, this article includes a list of the most recommended and the best treatment for varroa mites. Learn more about their benefits and features as you go read these unbiased product review. Please note that these products are listed in no particular order. Taking care of your bees is already tedious work, and worrying about those pesky little mites is one thing that should be removed from the equation. Of course, many processes require hard work but, we simply love to have a little shortcut. The Mite Away Quick Strips is a surefire way to get rid of varroa mites in a fraction of the time. The key to its effectivity is the formic acid contained in the plant-based gel. It is proven to kill up to 95% of varroa mites. The strips are very safe to the bees as it leaves no traces of harmful residues. It is very easy to apply due to its thin design which is suitable for the spaces between hives. 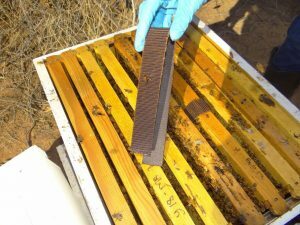 The recommended application is two MITEAWAY strips per hive. The package contains four strips – that is enough treatment for two hives. One of the best treatments for varroa mites that’s naturally occurring that’s available on the market is the Mann Lake DC301 Hop Guard Varroa Mite Treatment. It is derived from hop compounds which guarantees safety for both the queen and her bees. It can be applied for up to three times a year which means great value for your money at the price it comes at. This product contains a total of 24 strips which are saturated in liquid medication. Recommended application is two strips of the Mann Lake DC301 per 10 hive frames. The strips are best left in the hive for about a minimum of two weeks or 14 days. For best results, it is advised to use the strips at temperatures over 50 degrees Fahrenheit. Aside from the benefits that you can get from the package, you’ll be taking home a varroa mite treatment with a brand known for producing quality products. Mann Lake has been in the industry for many years, and their experience in the beekeeping industry is one way to assure you that you’re choosing worth-buying products. You want nothing but the best for your bees, and keeping them safe and healthy is a paramount responsibility. If you’re looking for an effective and proven mite treatment, you need to look for the best names on the market. One of them is the Mann Lake DC-799 Apivar. 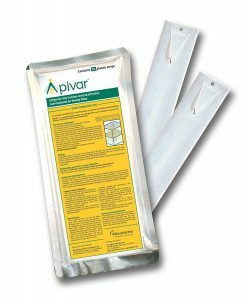 This pack of 10 plastic strips is capable of killing up to 99% of mites in just one easy application. The Amitraz component of this product can last over six weeks and is continuously released every time the bees come into contact with the strips. It doesn’t leave any sort of harmful residues which ensures the safety of the entire bee colony. It is also easy to use: just place one strip per five bee frames. The strips can also be used with a top bar hive setup. When not in use, the Apivar can last up to two years inside your storage. It is also reasonably priced. 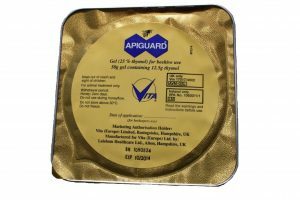 The Blythewood Bee Company Apiguard Pack for Varroa Mite Treatment is designed not only to eliminate varroa mites but to take care of chalkbrood and tracheal mites as well. It contains non-toxic and natural gel with an active ingredient of 25% Thymol. This product guarantees a kill rate of up to 95%. 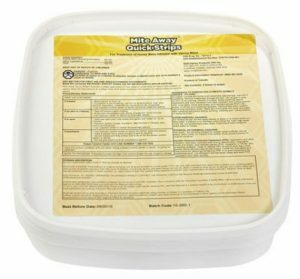 Since it is non-toxic, the entire bee colony is guaranteed safe during the whole treatment process. The key to its effectivity is the ability of Apiguard to exploit the hygienic behavior of bees inside the colony. Bees tolerates it very well. Because of this proven method, Apiguard is considered as one of the most ideal Integrated Pest Management (IPM) programs on the market. For a very low price, the Apiguard provides a great value for your money. To get the best outcome, do the treatment when the bees are active and during the highest daily temperatures. It is not advisable to use this product during spring flow. Effective varroa mite treatment requires back to back treatments. This means that you have to order multiple packs. That’s the only negative thing that you’ll notice with this product in comparison to others. The Oxalic Acid Vaporizer DIY Kit is designed to treat varroa mites fast and easy. It is an effective tool that even a beginner in the beekeeping industry can use. The vaporizer is made from high-grade aluminum with a wooden (oak) handle and 10 feet of wire (12 gauge). It is ready to be used the moment you open the box. Other brands may offer the same features for a cheap price, but the Oxalic Acid Vaporizer lives up to its promise of effectivity. This DIY kit includes a vaporizer, oxalic acid samples good for up to 50 treatments, safety goggles, ¼ teaspoon scoop, black gloves, 3m n95 mask, and an instructional guide. The time needed to sublimate the acid may take two to five minutes depending on your battery. Honey supers must be removed from the hive or place a barrier in between the supers and the brood chambers. The recommended amount of oxalic is ¼ teaspoon per bee hive. Make it a point to seal the hive with a cloth for at least ten minutes to ensure high levels of effectivity. Continue using oxalic for three weeks to completely eliminate the varroa mites. Varroa mite contamination is a very serious problem, and it needs an equally serious treatment which you can find in the Blythewood Bee Company NoVarroa Oxalic Acid Vaporizer. It is considered as one of the best oxalic acid vaporizers that you can ever find on the market. It is manufactured in Switzerland and now available online or at the nearest beekeeping equipment stores. The vaporizer is great for beekeepers with over 10 hives or to someone who simply wants the best treatment for varroa mites. It features a stainless steel pan which allows a controlled and even transfer of heat which in turn prevents the tendency of oxalic acid overheating. This vaporizer also features side wings to prevent the vaporizer from tipping inside the hive. To use: simply put the vaporizer cup with a gram of oxalic acid per brood chamber and connect the vaporizer to a 12-volt battery. The vaporization will take about 2 and half minutes to complete. Keep it inside the hive for an additional minute after disconnecting from the power source. Cleaning up is also an easy task – just rinse the vaporizer in a bucket of water and you’re set for the next hive. Having hesitations to use chemicals to treat varroa mites due to lack of experience? It is okay to feel extra careful with your bees especially if you’re a beginner. It is actually good. 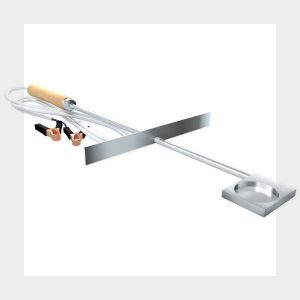 Don’t worry, Greenbeehives offers The Victor, a telescoping top heater with thermostat control designed for getting rid of Varroa mites without the need of chemicals. You can buy this product whether as an 8-frame or a 10-frame tool for the same price. This tool is also designed to automatically switch off after three hours. The first use of the Victor guarantees a Varroa mite kill percentage of 80%. A follow up treatment after two weeks will increase the kill rate to 95%. Managing the battery supply is also crucial to the entire process. Treatments done during the cold season requires a larger battery output. To ensure that you’re doing the treatment effectively, always do a mite count before the treatment. This will help you determine if additional treatment is needed. Fight varroa mites in complete gear with the Scott Bee Farm Heavy Duty Oxalic Acid Vaporizer v15.12. It is a full kit that comes with an organizational tool box, safety gear, and treatment supplies. It is no doubt more expensive that the rest of the items on the list, but you’ll get everything that you’ll ever need to get rid of those annoying varroa mites. Further, the kit is made in the USA. 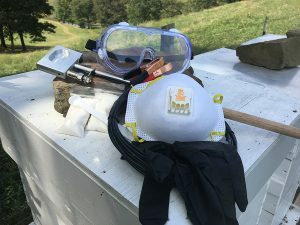 The kit is used for the vaporization of the oxalic acid inside the hives which is a proven method to kill tracheal and varroa mites. The vaporizer is made with the highest level of quality, durability, reliability, functionality, usability, and expandability. 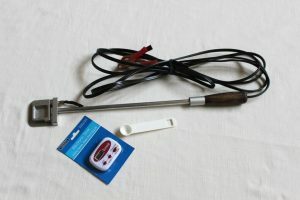 The vaporizer includes one measuring scoop for the acid, one digital timer, aluminum tubing which protects the electrical wires with a wooden handle for a comfortable feel on the hands, 12 feet of wire, soldered battery clips, glow plug, stabilization tray, and a CNC machined oxalic acid pan. The kit also includes a treatment journal, an entry block foam strip, 6-ounce spray bottle, oxalic acid good for up to a dozen treatments, splash goggles, a respirator, and protective gloves. What more can you ask for when Scott Bee Farm Heavy Duty Oxalic Acid Vaporizer v15.12 full kit has literally everything that you’ll ever need? It’s a great value for your money and should be considered in your search for the best treatment for varroa mites. The best beekeepers to consult with are people with tons of experience. If you’re looking for a vaporizer that truly works and is a product of experienced people, the Scott Bee Farm SBF8000 Oxalic Acid Vaporizer is the one for you. The design of this vaporizer is the product of more than 70 years of experience in the beekeeping industry. The vaporizer features aircraft-grade aluminum materials and other high-quality components. It also features a glow plug which can be replaced once the element burns out, an aluminum pan which distributes heat evenly, a bottom plate equipped with thermal cooling to prevent the heat from damaging the hive bottom, 12-inch wiring with battery clips, and a tool box. It just takes two minutes to treat a hive and only a gram of oxalic acid is needed per brood chamber. If you need a varroa mite treatment for your multiple bee colonies, then the Varomorus Propane Insect Fogger is the ideal product for you. It can treat an average of a hundred bee colonies in just 25 minutes. All it takes is just a puff of smoke from this equipment to treat one bee colony. Professional beekeepers trust this product due to its proven effectivity and versatility as its effectiveness ranges from 95% to 99.9% right after treatment. This portable device with a short-style (16.4 ounces) or a tall-style (14.1 ounces) propane cylinder which you can buy separately. The dimensions of this propane fogger measures 470 millimeters in length, 300 millimeters in height, and 150 millimeters in width. It weighs 1,350 grams. The Varomorus Propane Insect Fogger is also observed to be safe on bees. New beekeepers can use this product to treat Varroa mites, but it is highly advised to be in the company of a professional. Quite a few products on this list make use of a substance called oxalic acid. Now, you might be wondering what that is exactly, and in this section, we’re going to talk a lot more about it. Oxalic acid has gained a lot of ground as Varroa mite treatment in honey bees. Indeed, the natural organic acid has a high kill rate per application, quickly ridding your beehive of Varroa mites. In this guide, we look at oxalic acid treatment for Varroa mites in honey bees. The various methods of application and their advantages feature prominently. We also outline for you a few other things that you should take into consideration when treating for Varroa mites in honey bees using oxalic acid. Fogging with oxalic acid is a very fast and effective method of oxalic acid application. It releases a puff of hot oxalic acid vapor into the hive. The vapor cools on the surfaces of the treated beehive. Mites then come into contact with the acid as they move around the hive. 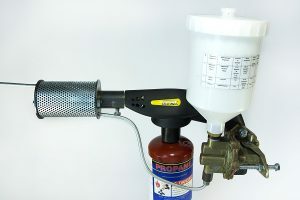 Beekeepers use an oxalic acid fogger, such as the Varomorus Propane Insect Fogger in this application method. Fogging gets the job done quickly. In under an hour, a beekeeper can treat a very large number of beehives. You get an even distribution of oxalic acid in the beehive. It is easy to monitor and adjust the temperature of the fogger. Some foggers even have temperature readouts on them. Using a fogger may cause you to inhale oxalic acid by accident. Caution must be taken to be upwind of the fogger just in case an accidental puff of vapor comes from the fogger. Propane foggers are generally purchased at a higher cost than other oxalic acid application equipment. They, however, save you significant amounts of money in the long-term. Firstly make sure you have all the materials, equipment and tools needed to carry out fogging. Prepare an appropriate oxalic acid solution and put it in the fogger’s oxalic acid tank. Attach any extension rods to the fogger if you so wish. Connect the propane gas to the fogger and light the fogger. Some foggers have igniters to make lighting the fogger easy. If your fogger runs on electricity, connect it to the power source and turn it on. Once the fogger is hot enough, give it a few trigger presses to see how much oxalic acid fog comes out. Approach the beehive from behind and remove the plug covering your pre-drilled fogging hole. Fog the beehive and replace the plug cover for the fogging hole. You may seal hive openings for a few minutes to prevent oxalic acid fog from leaving the beehive. Vaporization is one of the easy and inexpensive methods of oxalic acid application. It puts to use equipment called a vaporizer. The vaporizer has an acid pan on one end that is heated. Various heating methods are used by different manufacturers of oxalic acid vaporizers. Heating elements and glow plugs are the most popular heating technologies used. The acid pan in a vaporizer can get very hot. Beekeepers using a vaporizer to apply oxalic acid in a beehive should take care not to touch hot acid pans. The acid pan in a vaporizer is held in place by a metal rod with a handle. Some vaporizers have electric wiring in the rod, or outside it. All oxalic acid vaporizers run on electricity. DC power is required for the vaporizer to work. 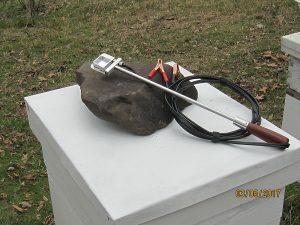 Beekeepers use various DC power sources to run their vaporizers. 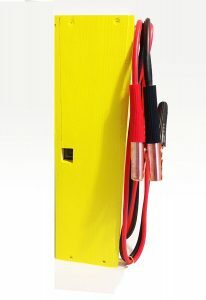 Car batteries, 12V motorcycle batteries and tractor or lawn mower batteries are used. Before commencing vaporization, make sure your battery is well charged to avoid inconveniences during vaporization. Vaporization achieves high temperatures that are great for oxalic acid sublimation. Electricity is a reliable way to power beekeeping equipment and is used in vaporizers. Purchasing a vaporizer does not drain your wallet. This is a major consideration for new or hobbyist beekeepers who do not want to spend much on bees. Oxalic acid vaporizers last for long without breaking down. If anything stops working, a vaporizer is easy to repair. Some DIY beekeepers have made vaporizers that work very well. Heating oxalic acid with a vaporizer is done in the beehive. This greatly reduces the risk of beekeepers getting exposed to oxalic acid vapor. Inhaling oxalic acid vapor is very injurious to your respiratory system. 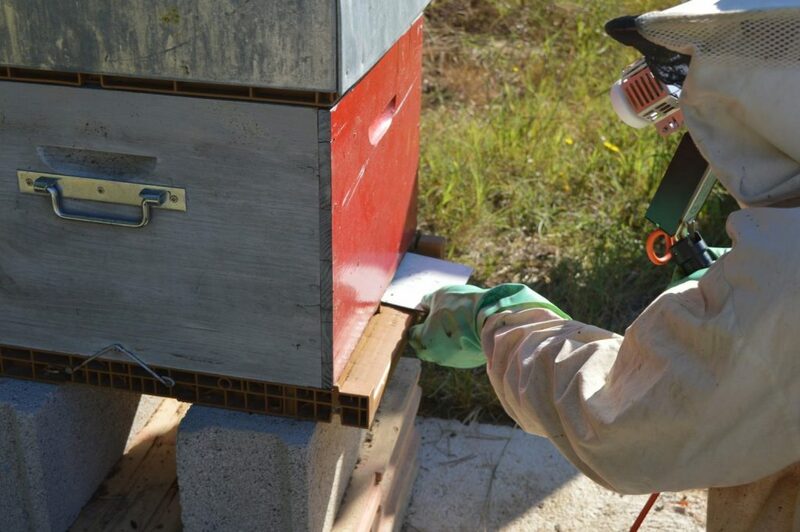 This method of oxalic acid application puts a heat source in your beehive. The vaporizer must be positioned in the beehive, at the bottom, and close to the center. If there is beeswax near the vaporizer, it may get ignited by the hot acid pan and cause a fire in the beehive. Treatment of one hive takes more than 10 minutes. Additionally, significant time is lost between successive beehive treatments. The vaporizer must be allowed to cool before acid is put in the pan for the next use. Beekeepers may use a bucket of water to cool the acid pan faster between hive treatments. You have to keep loading oxalic acid in the vaporizer for every hive treatment. The constant contact with oxalic acid increases the risk of exposure and subsequent oxalic acid poisoning. Beekeepers approach the beehive they are treating from the front. It inconveniences bees, aggravates them and makes them more likely to want to sting beekeepers. Assemble all the equipment and tools you need for vaporization. Place some oxalic acid in the acid pan of the vaporizer. Place the vaporizer in the beehive, preferably at the bottom. Have the acid pan at the center of the beehive. Plug shut all holes that may allow oxalic acid vapor to leave the hive. Connect the vaporizer to your DC power source and allow it to heat up. Once you are sure all oxalic acid has been vaporized, disconnect the vaporizer from the power source. Wait at least 10 minutes and then remove the vaporizer. You may keep the beehive openings shut for a further 10 minutes. Heating oxalic acid to high temperatures and applying it in the beehive is frowned upon by some beekeepers. As such, they opt to use trickling as their preferred method of oxalic acid treatment for Varroa mites in honey bees. Trickling applies oxalic acid into the beehive by putting it in solution and releasing it slowly from absorbent materials. Fabric and other absorbent material such as paper towels are the favored trickling materials. Releasing oxalic acid slowly in the hive at a constant rate gives very effective Varroa mite control. Trickling does not require beekeepers to repeat treatments. A single application lasts for long when done properly. Bees ingest more oxalic acid and may suffer ill health, resulting in a loss of hive productivity. You have to visit the hive again after some time has elapsed since initial treatment. This is due to the need to remove the absorbent material that you had put in the beehive. Bees may help with this, but you have to make sure. Not as efficient as other methods of oxalic acid application if you have a large number of hives. Collect all the materials, tools and equipment you will need. Prepare a trickling solution of oxalic acid. Soak your absorbent material in the oxalic acid solution you prepared. Open up the beehive and place the absorbent material with oxalic acid in the hive. Wait until the oxalic acid is released in the beehive and remove the absorbent material. There you have it – some of the best treatment for varroa mites that you can find on the market today. Whichever product you choose can deliver excellent results. Despite some drawbacks on some of the products on this list, the best way to overcome them is to properly manage your treatments. You can do this by analyzing what you really need and what you can actually handle. It is also advisable to get a consultation from a professional who has done mite control and treatments for numerous times. Try the one that suits you and your hive’s needs and keenly observe every progress. You may also consider the varying methods of applying oxalic acid treatment for Varroa mites in honey bees. The choice of application method is up to individual beekeeper. You must consider the number of beehives that you have, long-term suitability and safety when choosing the application method you will put to use. If you’re wary of chemical treatments, you may also consider using homemade alternatives for Varroa mite control. Good luck and all the best! What Varroa mite treatment control methods do you use in your beehives? Leave a comment below and let us know. Is the use of mineral oil in a propane fogger effective against varroa mites? Indeed, mineral oil applied via a fogger can be effective against varroa mites. We use mineral oil in an Insect Fogger with great success. Put 20 drops of wintergreen in 16 oz of mineral oil blow fog into hive entrance for 15 to 20 seconds until fog starts to come out lid. Treatment is complete & you will get a 50% or better kill rate. Inexpensive effective treatment. Hi Harvs, thanks for sharing. Essential oils can indeed play a major role in mitigating against mites. We wrote an article about how essential oils can be used for mite control and you can check it out by clicking here.